The Marshall Protocol Study Site > PROF. MARSHALL'S PERSPECTIVE > Prof. Marshall's Perspective > What more is there to Discover about Vit-D and Waves? 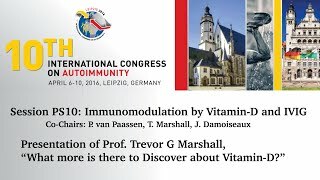 A video of "What more is there to Discover about Vit-D?," my talk at the recent International Congress on Autoimmunity in Leipzig, is now on YouTube. It highlights EMF interaction with VDR protein at the 14min, 15sec mark. p.p.s., the CDC says that 50% of US Adults suffer from chronic disease. This 50% are potentially having their disease symptoms made worse by Electrosmog from wireless communication devices. Page processed in 0.0420 seconds (85% database + 15% PHP). 17 queries executed.